Heathrow said passenger numbers totalled 6.97 million passengers last month, up 0.5% on July 2013. Both airports claimed the record numbers meant they, rather than their rival, should be expanded. "Only Heathrow can deliver daily. 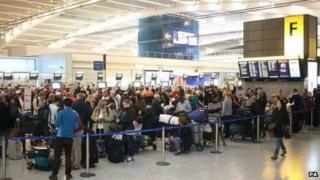 Gatwick can't, Heathrow can," said Heathrow boss John Holland-Kaye. However, Nick Dunn, Gatwick's chief financial officer, said a third runway at Heathrow would "diminish the choice available to British passengers". "We support competition, reduced fares and two world-class London airports serving the UK as a whole," he added. A third runway at Heathrow, the lengthening of an existing runway at Heathrow or a new runway at Gatwick are all being considered as ways of expanding the UK's air capacity. The Airports Commission, charged with deciding which option is best, is due to report after 2015.